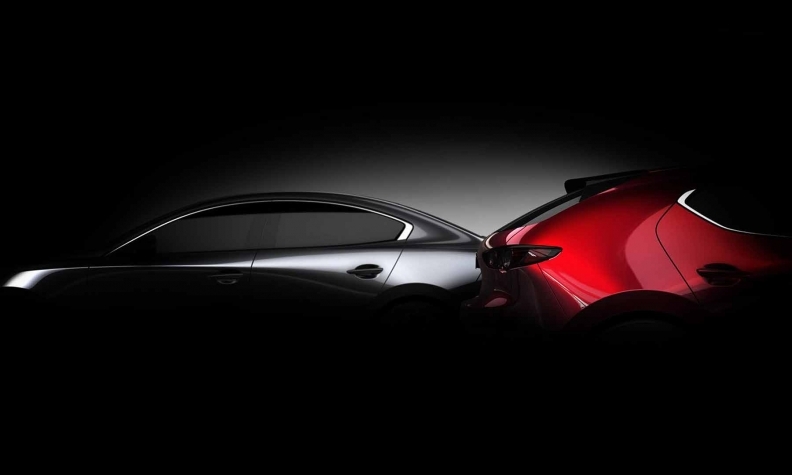 A preview of the next-generation Mazda3. TOKYO -- Mazda will present the next-generation Mazda3 small car at this month's Los Angeles auto show, kicking off a new era of performance-oriented vehicle platforms and Skyactiv-X drivetrains, all wrapped in a voluptuous new design language. The sedan and hatchback versions of the Mazda3 are expected to be on the stand. A teaser shot released Thursday by Mazda offers glimpses of both, with their rounded bodywork showcasing the reinterpreted vibe of the brand's Kodo design look. But the Mazda3 embodies more than just new styling. The compact car is the leadoff nameplate for an entirely re-engineered vehicle architecture that the automaker promises will weigh less, cost less and deliver a quieter ride with crisper handling and better rigidity. The Mazda3 also receives a new engine -- dubbed Skyactiv-X -- which Mazda says combines the best traits of diesel and gasoline engines for ultraclean power. Using a technology called spark-controlled compression ignition, it aims to improve both performance and fuel economy. Mazda CEO Akira Marumoto, talking about the car here ahead of its unveiling, said the strategy is to mate the Skyactiv-X engine to a mild-hybrid system. Marshaling the electric motor's power-assist ability will ensure linear acceleration and spirited driving, Marumoto said. It also will deliver a fuel economy improvement of more than 30 percent over a standard gasoline engine of the same displacement. The Mazda3 will be offered with the mild hybrid 2.0-liter Skyactiv-X engine or a current-generation 2.5-liter Skyactiv-G gasoline powerplant, Marumoto said. The Skyactiv-X variant will be positioned as the higher grade. It will have the driving dynamics of the 2.5-liter gasoline setup but the fuel economy of a 1.5-liter diesel, Marumoto said. "Skyactiv-X is a very efficient engine in the first place, so we don't need a full hybrid. Mild hybrid is good enough," Marumoto said. "And by using the mild-hybrid system, linear driving dynamics can be pursued as well. ... That's why we believe the grade should be higher." Mild hybrids are a key component of Mazda's plan to electrify every vehicle in its lineup by 2030. Electric vehicles and range-extender electrics will make up about 5 percent of the portfolio by then. Mild and plug-in hybrids will occupy the remaining 95 percent. Mild hybrids will be the majority of those hybrid offerings, Marumoto said. The new design language was previewed in the Kai Concept shown at last year's Tokyo auto show. The concept hatchback channeled a "less is more" minimalist Japan aesthetic. The new design ethos adopts more supple, simplified styling and ditches sharply creased and intersecting character lines.